A laugh in every line to get you in the festive mood. BOOK EARLY. 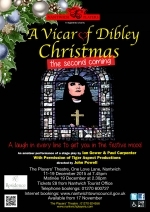 A Vicar of Dibley Christmas â€“ The Second Coming will be a sell-out. Geraldine Granger is the much loved and chocolate addicted village vicar where she runs chaotic committee meetings and organises quizzes (even allowing nice but dim Alice to defeat curmudgeonly father-in-law Councillor David Horton). She sets up Radio Dibley, that unsurprisingly does not run as smoothly as expected with a rather startling on-air confession from boring Parish Clerk, Frank. Then there is the Christmas Nativity play to audition, cast and rehearse. Elvis as one of the three Kings? But who will play Joseph and as Hugo has been to furniture-making classes he would seem the ideal person for the role. With Hugoâ€™s expectant wife Alice, the casting of Mary could not be bettered. Needless to say there is a riotous conclusion. This specially written script by Ian Gower and Paul Carpenter is adapted from the TV series with all your favourite characters. Directed by John Powell, performances will be at 7.45pm on 11 - 19 December, 2015. Auditions will be held at the Theatre at 7.45pm on Tuesday 29th September. Non-members may audition by joining and paying membership on the night. Tickets priced at Â£8.00 will be on sale from Nantwich Tourist Office (01270 600727) or on-line at www.nantwichtowncouncil.gov.uk from 17 November 2015.